Reporting what happened at an academic conference is perhaps the most boring task any journalist or freelance writer can ever accept to perform. The form, format, and outcome if any, is always very predictable. Usually, there is a keynote speaker who sets the tone of the conference at a time when expectations and spirits are very high. Then presenters from different parts of the globe read their papers and the audience listens depending on the time of the presentation. The unlucky presentations slated before lunch time have more heads bowed and eyes at quarter to shut down than are active listeners. The same fate awaits presentations just immediately after lunch when stomachs are filled, heads light, and legs in-between light and heavy. So why bother any one with reporting on what happened (or did not happen) at an academic conference? I have no answer to my own question but I can only crave your indulgence to come along with me to a two-day conference which took place toward the end of February 2009 at the <?xml:namespace prefix = st1 ns = "urn:schemas-microsoft-com:office:smarttags" />University of Florida, Gainesville. The sub-theme of the conference probed into mother tongues and other tongues. It brought to the University campus a group of Africans, Africanists and friends of the continent to do what academics love to do best-share - knowledge about things they know and some times things they want to know. I must confess that this particular conference, put together by Professor Akintunde Akinyemi, a specialist in Yoruba language and literature, sort of combined theory and practice in a very unusual blend. That his main academic turf is African oral literature and popular culture, may be the reason why tongues, ears, and eyes were in perpetual service from the beginning to the end of the conference when another eminent Nigerian academic Professor Biodun Jeyifo, almost brought the roof down with his re-telling of the “Who wrote Things Fall apart” joke. To earn your attention I will delay (or even deny you) the content of this joke as my own narrative joker. Let us start from day one, when Professor Karin Barber, a real eminent Professor of cultural Anthropology in the Center for West African Studies, the University of Birmingham, United Kingdom, held every one spell bound. Note that my use of ‘real’ in conjunction with her professorial status is deliberate. This woman’s story is more dream-like than real. She speaks Yoruba like a native speaker, writes her little note to me in the tonal language complete with accent marks, and as the story goes she was once a member of the Oyin Adejobi traveling theater in days when Nigeria and Nigerians cared for the theatre. For instance, she brought into our consciousness the case of a Ghanaian keeper of proverbs who functions as the repository of new knowledge and encrypted ideas. To every new idea the keeper has an artifact he hangs in his living room as a reminder of the content and essence of the proverb. If ever there is going to be a museum of proverbs, the Ghanaian example she brought to our attention will be a perfect model. As her voice trails off, we suspected that the smooth vocal ride was coming to an end and according to her “Africa today is truly the continent that ‘always brings something new’ to the global table. There were eight other presenters, two of which were represented by proxy. 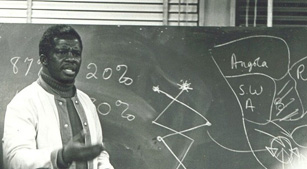 Professor Akinwumi Isola, the creative back-bone of Mainframe movies, could not appear in person. His paper was presented by one of his former students; Professor Akintunde Akinyemi. Isola’s paper spoke to the purpose of literature in Africa, spiced with humor. He gave a bird’s eye view of what literature can do to a people and what people do to literature. Then there is Ken Bugul, born as Marietou Bileoma, but had to take a different name at the behest of her publishers. The kind of explicit issues her work deals with cannot be associated to a woman from her part of the world. So what beef does she have with the French and their language? During the twenty minutes she was allotted, she spoke her mind on “What is a tongue? What is mother tongue? What are other tongues?” I tell you she gave answers to all those questions but what interested me was her personal story and elaborate gestures. Her daughter born in Congo to a Yoruba father; grew up in Togo, but now lives somewhere in America. The product of Ken Bugul's womb like the product of her tongue- symbolizes transnationality, diversity, and complexity. She sort of threw a romantic challenge to scholars, who as you know, mask their emotions in public. She moved a brown shawl that sat gingerly on her shoulders and tied it on her head to signify her marital status. To her, women in Senegal, especially those from her Ndoucoumane part, communicate with parts of their dressings. If a woman ties her shawl in a particular way it signifies she is single and welcoming of male advances. She left the shawl on her head through out the conference inviting the brave to make the move. I was later to learn during the reception held for participants by the Center of African Studies, that none of the men in attendance was brave enough to fall for the open invitation! But beyond her theatrics and light heartedness she slipped in what I think are profound ideas. According to her: “Mother tongue is feeling, smells, tones, sounds, and touch. I am not writing in French, but I am writing in my environment, the environment of my birth, of my growth.” You are free to blame my inability to savor her stories of female empowerment because of my incompetence in the French language. As soon as she finished her presentation, and the wide screen announced the presence of the Frank Porter Graham Professor of Africana Studies at the University of North Carolina at Charlotte, I knew a chariot of militancy had arrived for me. So if there was a personal highlight of ‘day one’, it was the opportunity to listen to Professor Tanure Ojaide, the scholar, poet and polyglot, creative writer who writes in Urhobo, pidgin, and English languages. The title of his paper was testimony to his liberty of thought in a highly restrained academic environment filled with conventions and stiffness. “I go siddon look: Dialoguing with my people” was his offering to the mixed audience. To really appreciate Professor Ojaide one must not only be in his physical space but should take flight into his eclectic mental spaces which stretches from Niger Delta to America and back to the African continent. Somewhere during his presentation, we were given new meanings to words like 'download' and 'delete'. Just in case you are in Warri, Nigeria, and you overhear someone include 'delete' in his speech, check to make sure that the user of such an innocuous word is not referring to you. Apart from what is means in ordinary English usage it is also a term that connotes elimination. So a person can be deleted and downloaded (buried in ordinary English everyday usage) without much attention. Boubacar Diop’s absence did not invalidate his views. His paper written in French was translated and delivered by Abdourahmane Idrissa. At this point, I must own up to my poverty of literary discourse and high level ideas. I must confess that it was Professor Eileen Julien who helped me make sense of the ideas in this paper. According to her, the tone of the paper by Diop, a Senegalese novelist, journalist, and screenwriter, was that of anger. Anger at the colonists and their imposition of tongues on creative writers. According to Diop, there is hope in the horizon since colonially-inherited African literature is fated to perish, and a review of literature in the Senegalese Wolof languages, as well as of actions and organizations geared to developing the written usage of African languages indicate the path of the future. Kole Odutola is a teacher of an African language.